Joe Howell has been a business and transactions lawyer in Santa Barbara since 1974. His clients include individuals and established business entities, as well as start-up and emerging growth companies. In recent years, a large part of Joe’s practice has been devoted to the representation of clients engaged in merger, acquisition and sale of business transactions. He often assists them in the transition of their business interests, whether to the client’s next generation or to a private or public company buyer. Joe also represents a broad array of insurance/financial services and technology companies, retailers and restaurants, as well as professionals/groups in the healthcare, legal and accounting fields. Given the breadth and depth of his relationships in the legal, business and professional communities of Santa Barbara, Joe brings a unique level of personal and professional experience to his clients. In addition to those clients for whom he has served as counsel for years, Joe continues to add a select group of new clients, including both start-up and seasoned business entities. Joe enjoys an AV rating from Martindale-Hubble, the highest rating given practicing attorneys in terms of both professional competence and ethics. Joe began his career in 1973 as a Briefing Attorney (law clerk) at The Supreme Court of Texas. 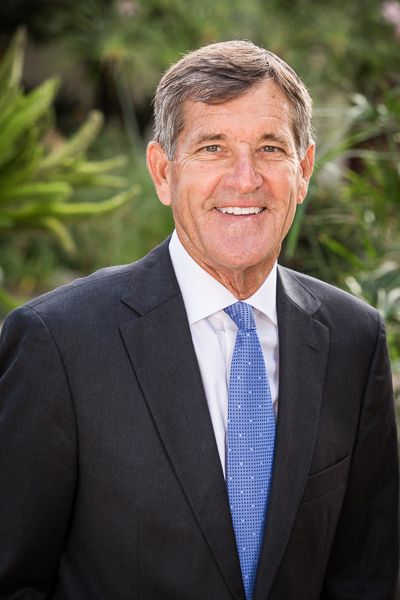 He moved to Santa Barbara in 1974, joined the firm of Schramm, Raddue and Seed (which became Schramm & Raddue) and practiced with that firm as a partner and as Managing Partner until forming Howell Moore & Gough LLP in 1996. Joe and his wife Barbara drove through Santa Barbara on their honeymoon in 1973 and decided it was the place they wanted to live. They moved to Santa Barbara a year later. Barbara recently retired after serving as a teacher and education coordinator. Son Ben is a lawyer and daughter Sarah is a teacher, both living in Los Angeles with their respective families. Joe’s outside activities include Board and leadership roles with a variety of community organizations, cycling, distance running and competing in marathons and triathlons. Joe was inducted into the Santa Barbara Athletic Round Table Hall of Fame as a Community Leader and was selected for the Santa Barbara News Press Lifetime Achievement Award and as Semana Nautica Athlete of the Year. He currently serves on the Board of Directors and Executive Committee of American Riviera Bank.